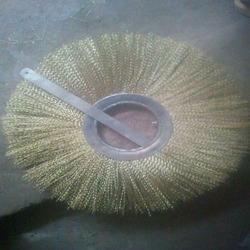 We are successfully ranked amongst the top manufacturer and supplier of an exclusive range of Road Cleaning Brush. This product is used for road cleaning purposes and appreciated for its quality of properly sweeping the paper, sand, dirt, plastic and varied other rag. Our product is manufactured by our experienced professionals in accordance with the industrial standards using premium grade raw material and advanced technology. In order to ensure its quality, entire range tests on well-defined parameters of quality. We are the top most organization among the leading manufacturer and supplier which are engaged in offering a huge quality range of Road Cleaning Brush. Our products are manufactured by using high grade of raw material and known for their best performance.